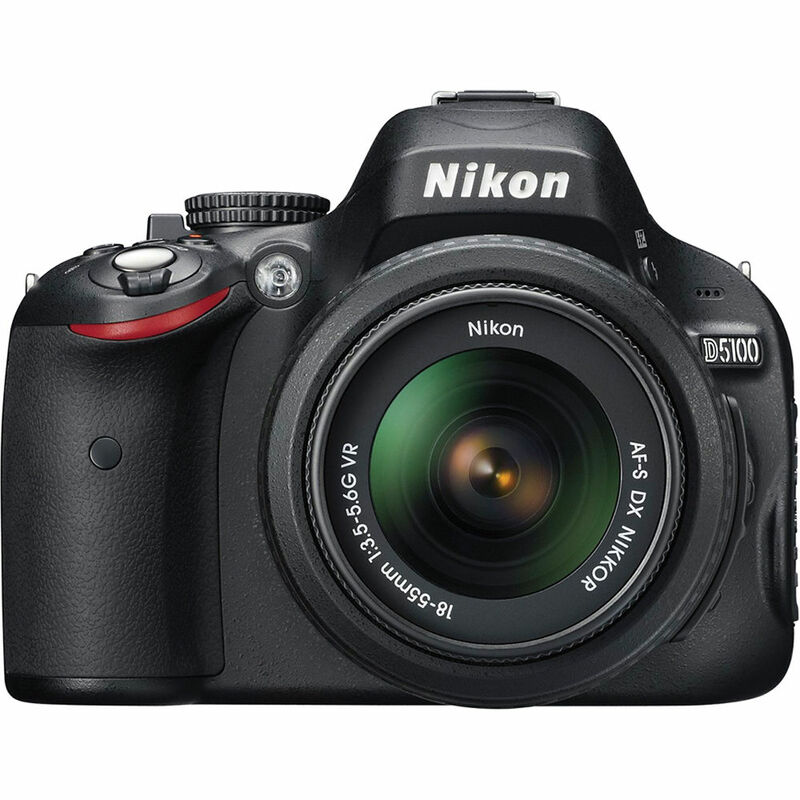 Nikon's D5100 Digital SLR Camera With 18-55mm f/3.5-5.6G VR Lens delivers numerous professional features in a consumer digital camera. A high-resolution 16.2MP DX format CMOS sensor and an EXPEED 2 image processing engine guarantee superb quality and high performance. The 3" vari-angle tilting LCD monitor allows you full freedom in composition with sparkling 921,000-dot resolution. Full 1920 x 1080p video with full-time autofocus (for tracking subjects in motion) and stereo sound (using optional microphone) is always available with in-camera editing and creative controls to bring out your inner director. The AF-S DX Nikkor 18-55mm f/3.5-5.6G VR lens is an ultra compact, lightweight standard zoom lens that has a 3x focal zoom range and is ideally suited to compact Nikon digital SLR cameras with the DX size sensor. Vibration Reduction, engineered specifically for each VR Nikkor lens, enables handheld shooting at up to 3 shutter speeds slower than would otherwise be possible. This lens offers the most basic zoom range in the DX lens series, an equivalent focal length in 35mm terms of 27-82.5mm. It will conveniently cover everything from landscapes to tight indoor portraits to standard snapshots. The D5100's Effects mode provides a dazzling array of special effects for putting your own individual stamp on all of your images--still photos or video. Selective Color, for instance, isolates any color within a scene, and Night Vision captures details in places too dark for your own eyes. High Key effect will create bright, glowing images filled with atmosphere and mystery, or you can emphasize the mood of a scene using Low Key, or Miniature Effect--which produces a scene that looks like a miniature scale model. With sensitivity ranging from 100 to 6400 ISO, you'll be able to make photos and videos that are amazingly rich, even in low light. In-camera HDR (High Dynamic Range) mode will tame high contrast situations by automatically capturing multiple exposures of the scene and combining them for vastly improved contrast and low noise. A blazing fast 11-point autofocus system and split-second shutter response mean that you won't miss photo opportunities waiting for your camera to catch up. The built-in speedlight has i-TTL for accurate, well-balanced flash every time. With the Scene Recognition system, 420-pixel RGB 3D Color Matrix Metering II, 16 automatic exposure scene modes, and Active D-Lighting, your control over your photos and movies will be more precise and simple to carry out than ever. The automatic image sensor cleaning prevents dust from ruining any of your images. The new, large 3.0" (7.5-cm) vari-angle LCD monitor opens horizontally up to 180˚ and flips up and down from +180˚ to -90˚. Now you're ready to view, shoot and record your subjects from unique perspectives. Try a high angle for overhead shots, waist level for candid Live View and movie shooting, or a low vantage point for a look from ground level. You can also place the D5100 on a tripod or other stable surface and still see yourself while composing self-portraits. Thanks to high-resolution (approx. 921k-dot) and a wide viewing angle, the vari-angle LCD monitor lets you check your composition comfortably while using Live View or full HD movie. Incorporating the latest Nikon D-SLR technologies such as the 16.2MP DX-format CMOS sensor and EXPEED 2 image processing engine, the D5100 delivers outstanding image quality. The D5100 delivers exceptional D-Movie performance with its full HD capability, full-time-servo AF (AF-F) and precise exposure control. In-camera movie editing and sound recording capability (stereo with optional microphone) are also provided. Together with D-SLR advantages like beautiful background blur, high ISO sensitivity performance and extensive NIKKOR lens compatibility, movie-making potential reaches impressive new levels. The D5100's numerous editing functions include Resize, NEF (RAW) processing and Filter effects, such as Skylight, Warm filter and Cross screen. Along with Quick retouch and Edit movie, there are additional features such as Distortion control and Fisheye. The D5100's 11 focus points, including a crosstype sensor, widely cover the frame and capture the subject sharply. When using 3D-tracking (11 points) mode, the camera works together with the Scene Recognition System to keep your main subject in focus even if the composition changes. When shooting extreme contrasts such as sunlit clouds and a foreground deep in shadow, it was once quite difficult to render both textures equally. Not anymore. With the HDR setting, the D5100 takes two shots within a single shutter release: one overexposed and one underexposed. The camera then combines the two images to reveal an extremely wide dynamic range, but with less noise and richer color gradation than ever before (use of a tripod is recommended). The D5100 provides all the technologies you need to achieve excellent results even when available light is scarce. Its CMOS sensor offers a remarkably wide ISO range (ISO 100 to 6400) with reduced noise. This enables you to shoot at faster shutter speeds and capture scenes and subjects with less blur. Even handheld shots and full HD movies come out looking great in low light. Vital for dark or backlit subjects, the D5100's built-in pop-up flash automatically brightens your subject. Expect natural-looking results thanks to i-TTL flash control. Select up to three colors to show in the image, and the rest will remain in black and white. The D5100 helps you focus by offering a choice of focus modes to match your subject matter - even when using Live View or shooting full HD movies. Simply use AF-F mode to keep the camera focusing automatically while recording. A new switch beside the mode dial activates Live View, and to start movie recording, simply press the dedicated button located next to the shutter-release button. You can do this while keeping a steady view of your subject. The D5100 has Scene Modes that match a diverse range of scenes. The five most popular modes can be found on the mode dial, while others can be selected by setting the dial to SCENE and rotating the command dial. Once you've decided, the camera automatically chooses the camera settings that will provide the best results. With Nikon's Scene Modes, you will never have to worry about complicated camera settings. If you are shooting still pictures using Live View with Auto or Auto (flash off), Scene Auto Selector will automatically select the most appropriate Scene Mode, choosing from Portrait, Landscape, Close up, and Night portrait. Leave it up to the D5100 to deliver optimum results, leaving you more time to concentrate on the shot. Make distant subjects appear like miniatures by strategically altering the focus area. Miniature effect movies play back at high speed. Create bright, glowing images filled with atmosphere. Make your images appear like colorful drawings. Movies shot in this mode play back like a slide show made up of a series of stills. Capture your subjects in silhouette against bright backgrounds. Create dark, striking images with prominent highlights. Take monochrome (black and white) images in extremely low-light conditions. Useful in a variety of situations, Active D-Lighting automatically renders the highlights and shadows of high-contrast scenes so that they appear more like how they are perceived by the human eye. Leave Active D-Lighting on Auto for effortless adjustment, or select the strength level according to your shooting conditions. Less dust means clearer images. Nikon's exclusive system helps remove dust from the optical lowpass filter in front of the sensor and move it away from crucial components inside the camera. Approx. 95% frame coverage - for a clear view and comfortable shooting without time lag. The camera's form fits naturally into your hands, with intuitive controls that make extended shooting easy and comfortable. Efficient EN-EL14 battery lasts for approx. 660 frames per charge. This simple and intuitive software helps you get the most out of your images and full HD movies. ViewNX 2 provides importing and browsing capability while also incorporating image-editing functions such as Resize, Brightness, Crop, Straighten and NEF (RAW) image processing. Its movie editing functions help you create your own original movies quickly and easily, and Nikon's own image storing and sharing service, my Picturetown, works smoothly with ViewNX 2, allowing you to log in directly from the software for easy uploading without using a browser. Enjoy pictures and movies on your television, and use the TV remote control unit to operate playback. Sometimes the sound of the shutter release may disturb your subject. Quiet shutter-release mode reduces the sound of the D5100's internal mechanisms, by slowing the mirror movement speed at the moment the image is captured, for example. With the 420-pixel RGB sensor and CMOS image sensor working together, the D5100 is able to recognize your subject matter and optimize the auto exposure, autofocus, auto white balance and i-TTL flash control. The face-priority AF feature originates in this technology, as well. Customize the look and feel of your photos to suit your taste with Picture Control. Choose from six settings: Standard, Neutral, Vivid, Monochrome, Portrait and Landscape. You can adjust the settings and save them for future use. Nikon's own image-sharing website, my Picturetown, allows you to easily store, manage and share your images with your family and friends worldwide. Membership is free and permits storage of up to 2 GB of photos and/or movies. One ED glass element and one hybrid aspherical lens element guarantee high-resolution, high-contrast images while minimizing chromatic aberration, astigmatism and other forms of distortion. The improved SWM built into the lens offers smooth and quiet autofocus performance. Box Dimensions (LxWxH) 12.9 x 6.7 x 5.3"
D5100 Digital SLR Camera With 18-55mm f/3.5-5.6G VR Lens is rated 4.7 out of 5 by 751. Rated 5 out of 5 by Anonymous from Great buy! I was looking for a nice upgrade from my D60 and went with this camera after weighing in the features. The flip out viewing screening is a great feature that I quickly got used to and now love. It's comfortable and gives great photos as well. The video quality is pretty good too however, zooming while recording is a bit difficult and doesn't come out very clean but other than that it's not bad. I wouldn't use it for any serious shooting. I even got this refurbed form B&H which got me a great deal in price and it's just like new! I have experience in DSLR's but this would work for beginners as well. Very happy with my purchase. Rated 5 out of 5 by Sneezing just looking at the flower pics from Upgrade from the D40 I love to take floral pictures in the spring. Our neighborhood in Northern VA bursts into bloom and for a month or so, everything is a riot of color. I like to zoom in on flowers, but I was having some trouble getting the clarity with the D40 I had as my beginner camera. I was told that the D5100 has 16 something or other (pixels?) whereas the D40 has only 6, and that could make a real difference. It surely does. Now I am out every morning and evening, taking pictures of the beauty of Spring, so I can remember it as more than just a colorful blur. Although I have not tried it yet, I was also very pleased to see that the D5100 has a video recorder. Rated 4 out of 5 by Mitchell from Love it! I am a broadcast TV professional and my wife is an architect. We are both photo enthusiasts and we both find lots of uses for the camera in our work. This camera has terrific bang for the buck although it is better suited to less experienced photographers. I say this because it does not take the full range of Nikon lenses and it is not easily adapted to pro use (focusing screens, etc.). If you plan to use your old Nikon lenses or want to get into that aspect, make sure you know what will and won't work before you buy. That said, it truly does everything it says it will do and everything a camera at this price should do and much, much more. Rated 5 out of 5 by Anonymous from D5100 has Great Flexibility The side mounted viewing screen of the Nikon D 5100 make it a great camera for certain types of macro work and for shooting over the heads of a crowd. I have both the D 7000 and the D 5100. Their similar menus and electronics make these a great combination. Both have excellent lowlight capabilities which allow very high ISO settings with remarkably little noise. The quality of very high ISO images make it practical to have very fast shutter speeds with high quality pictures when this is needed. The D5100 is my camera of choice in a number of macro and large crowd settings. There are other circumstances where features that only the D7000 has make it my camera of choice. Rated 5 out of 5 by bekwil from Great so far! I am an amateur enthusiast and recently took this camera on my family trip to the San Juan Islands. Great range with the 18-55mm lense, clarity throughout. Image stability works well, colors are truest of any camera I've used. I like the protection the flip screen offers, but find it obnoxious to be flipping open then closed all of the time. I will probably just leave it open for the periods when I'm turning the camera on and off to use at an event or at one time and only close it up for storage. Overall, this camera has been a great entry into dSLRs and I hope to maximize it's filtering capabilities as I learn more about what it can do! Rated 5 out of 5 by Eko@23 from Newby + D5100 = Happiness After deciding to upgrade from a point and shoot to a DSLR I got the Nikon D5100 and it has been a joy to learn the basics of photography with it. The menus are very intuitive so you can easily understand the different settings and outcomes you can obtain. The difference in the picture quality is astonishing and will have you shooting and shooting until the battery says enough. After finishing your shoots remember to turn it off so the battery will last the 600+ shoots Nikon claims. The only downturn is that you will be searching what other lenses and accessories to add to your cart and that can be very, very dangerous ( to your wallet ). Rated 3 out of 5 by C Hy from Controls could be better I've been using the Nikon 5100 for a week now. Its small and easily portable but I wonder what drove the placement of the external controls. I have a bottom of the line Canon DSLR and the controls are better thought out and better placed than on the 5100. It seems Nikon placed the controls on this camera at random! Frustrating in an otherwise good camera! Picture quality is very good with good dynamic range. Tilt screen is handy. A good camera for informal travel photos. I tried to buy a D7000 but they were all out when I purchased this camera. I'm sort of glad I didn't spend the extra money. I think I might go back to Canon if the image quality is similar. Rated 5 out of 5 by Anonymous from Nikon is my 'Signature' Camera This is the seventh Nikon I have owned and quite simply I would not even consider any other brand. Overall, Nikon's design, handling, and operational excellence is incomparable. I fell in love with my first Nikon almost forty years ago and it has been a wonderful match. While searching the right place to make this purchase I was easily won over by the careful and thoughtful recommendations of the staff at B & H. The patience and good advice was so welcome! I can see that it will take a good deal of study to learn all the great things that my D5100 can do, but it will be pure joy with the manuals and the DVDs to help. Clearly, I am thrilled with this new 'toy'!